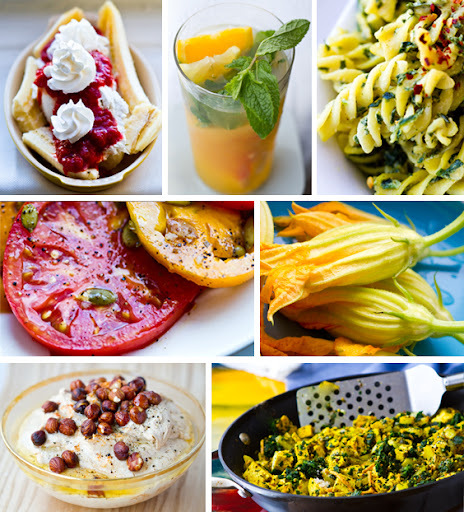 This week's Meatless Monday recipe Round-Up!.. The perfect hot breakfast to whip up when you are in a hurry, yet still craving something warm and satisfying to get you through your day. If you haven't fully indulged in the joys of summertime eating - here are my top seven "summer eats" to help you embrace the season. If you haven't checked out these vegan breakfast recipes yet - I hope you will! Try them for a weekend brunch, breakfast or even a Meatless Monday "breakfast for dinner." This warm and cozy bowl of hummus has a savory sweet flavor with the intoxicating essence of rich, dreamy hazelnut oil. * I love these Corn Cake Bean Balls - mushroom version too! * Totally refreshing would be a crunchy raw veggie wrap - or I could grill it thin for a veggie quesadilla. So many recipes, so few Mondays!!! Please share with a non-veg friend to hopefully inspire them!